Published just over a month ago by Flavoured Books, The Galilean Kitchen is already being well received online, through articles and book reviews in The Jerusalem Post and Hadassah magazine. The focus of each article is on the cultural flavours that ooze out of the kitchens where Ruth Nieman, author of the cookbook, spent a year gleaning how to replicate these Arabic dishes, using authentic spice blends and fresh, seasonal, local produce. 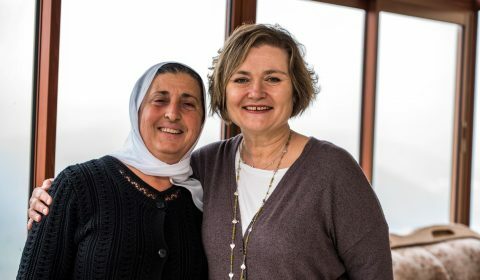 “There are no cookbooks in these kitchens” Ruth tells both interviewers, “all the recipes are handed down through the generations and by adding a touch more za’atar, a pinch of baharat or an extra clove of garlic or two, the recipe becomes each cooks own”. Ruth then painstakingly deciphered the ‘handfuls’ into cups, grams or tablespoons and puts pen to paper, allowing the reader to create these delicious Middle Eastern recipes from the Druze, Muslim, Christian and Bedouin communities, in the comfort of their own kitchen. Red Magazine has now published on line Amira’s Cauliflower Sinye from the cookbook as part of ‘Veganuary’ with social media feeds, trending about this comforting, vegan dish. With beautiful, vibrant imagery throughout the book by photographer Neil Mercer from Kibbutz Tuval, The Galilean Kitchen holds its place on any kitchen shelf along side all Middle Eastern cookbooks and now is available to buy in Joseph’s Bookstore, Temple Fortunes, NW11 & Muswell Hill Bookshop, N10.